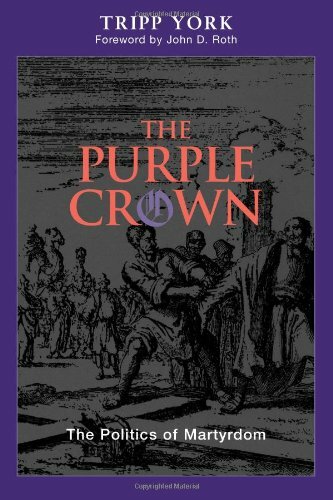 The Purple Crown: The Politics of Martyrdom (Polyglossia: Radical Reformation Theologies) by Tripp York. Scottdale/Waterloo: Herald Press, 2007. Pp 199. $19.99, ISBN 978-0-8261-9393-0. Through recalling the truthful performances and writings of the early church (e.g., Ignatius of Antioch, Polycarp and Cyprian) and of those on all sides of the Reformation, through examination of Augustine’s account of the analogical relationship between the Civitas Dei and the Civitas Terrena (each with their rival soteriologies), through a biography of Oscar Romero which is itself ‘a gospel’, and drawing heavily on the work of William Cavanaugh and John Howard Yoder, York reflects on the natures of, and relationship between, word and deed, and reminds us that martyrdom is the kind of public, political and liturgical witness – a second baptism, and ‘a moment in rhetoric’ (p. 146) – that unapologetically reveals the world to be the world, and reminds the church, as does the eucharist itself, that ‘allegiance to the heavenly city presumes an exilic posture that confers a missionary stance’ that sometimes, though not always, takes the shape of martyrdom (p. 100). But martyrs are not victims; neither is martyrdom tragic. Rather, as York reminds us, the logic of martyrdom belongs in the world of the apocalyptic, the witness participating in ‘the ongoing creation of not an alternative world but an authentic world: a world inaugurated by the cross and the empty tomb’ (p. 147). While few readers will follow York on every point, and many will want to go deeper and wider than this essay does, this book is a clear, insightful and ecclesiologically-fruitful introduction to the relationship between martyrdom and discipleship. What is Fresh Expressions and what might we learn from it?